I just noticed that the book I illustrated,'No Easy Way' is up on Amazon and available everywhere next month. The title is apt as it was no easy way all the way through what with all the research, the drawing painting, and unexpected life issues.I now have more baseball gear from the 1940s in my propfile and have listened to more vintage baseball broadcasts than anyone save the archivists in Cooperstown! The Junior Library Guild of Ohio (I got an award, complete with a pin) and the Beverly Hills librarian in charge of children's books really liked it, and I am awaiting some response from Red Sox town. Lucia Monfried was a terrific art director through all this , as was Irene Vandervoort, the designer. 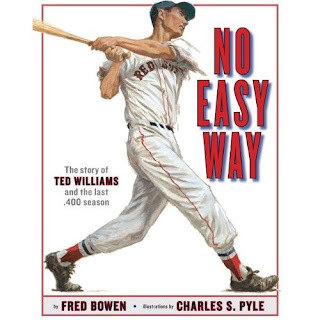 I hope the author Fred Bowen, and Ted Williams' ghost, are happy, too. 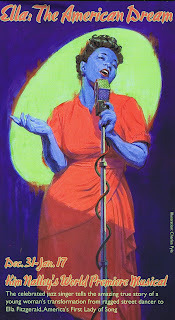 New poster for Kim Nalley's play, 'Ella", about the early years of Ella Fitzgerald's career. Dancers, a band (think ChickWebb), and a tight cast.The premier is at Cinnabar in Petaluma and the previews have been stellar. Kinda weird seeing this ten feet tall in downtown Petaluma. Now it is on to the second play poster!